Through a Request for Information processed by the City of Glendale, I obtained information about arena management company finances over the years. I do not have a complete picture but I do have information that relates to 2006 to 2007, during the time when Jerry Moyes was the majority owner of the team and arena manager, and 2010 to 2013, the time that the NHL has been owner of the team and arena manager. From the time the arena opened in 2003 to 2006, Steve Ellman was majority owner of the team and the arena manager. Records for his period of management are as elusive as the man himself. When the national economy went south the two men responsible for bringing the team to Glendale left it, holding the bag. Is it karma that Steve Ellman declared bankruptcy regarding Westgate and Jerry Moyes declared bankruptcy regarding the team? In 2006 to 2008 the arena was managed by the Arena Management Group, LLC (AMG), a Delaware Limited Liability Company. The managing member and 100% owner of AMG was Coyotes Holdings, LLC (CH) and Jerry Moyes was the majority owner of record. Moyes was originally a minority partner in Steve Ellman’s ownership group, which bought the Coyotes from Richard Burke in 2001. On September 26, 2006, Ellman sold controlling interest in the Coyotes, Arizona Sting, and the lease to Jobing.com Arena to Moyes. Independent Auditor’s Reports by BDO Seidman, LLP., an accountancy and consultancy firm, were produced that covered the period of 2006 and 2007, just prior to Moyes’ bankruptcy filing. The managing member(s) had plowed over $22M to cover the losses incurred in 2006 and 2007. The general and administrative expenses appear to be disproportionately high during this period. In 2008, Moyes told Gary Bettman that he would stop funding the club and so, the figures for 2008 were not included in this request. The NHL was willing to provide funding on an emergency basis if Moyes would turn over his voting control. Their divisiveness became public in May 2009 when the League nearly sold the Coyotes to Jerry Reinsdorf. Moyes would have received very little, if anything, from the sale. Moyes immediately put the Coyotes into bankruptcy protection and announced a plan to sell the club to Jim Basillie. 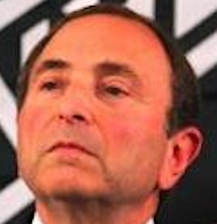 Moyes also filed a lawsuit against the NHL, alleging the league was an “illegal cartel.” Bettman, in return, argued that the league had been blindsided and that Moyes did not have the authority to put the club into bankruptcy protection. Financial records for 2009, during this period of turmoil were not provided from the city. In the 3 years in which the Arena Newco, LLC., (NHL) has been managing the arena, and according to the documents that they submitted to the city, the costs and revenues have been pretty consistent. Revenues average in the $6M to $7M range and expenses average about $12.5M. The Net Operating Loss average is about $5.5M. If you look the Moyes figures and the NHL figures they are pretty close to one another. I think it is safe to assume that the costs of operating the arena with the team as an anchor tenant will be in the $12M to $13M range. Revenues have consistently been in the $6M to$7M range with an annual operating loss of about $5M to $6M. Keep in mind these figures do not create any Return on Investment for any of the 4 groups and their investors vying to acquire the team. If the city council rejects all of these potential buyers it is safe to assume that they will be looking an annual expenditures of about $8M to cover the construction debt payment and another $12M to operate the arena. Undoubtedly that $20M annual expenditure will be offset by sales taxes collected on revenue but they should not expect revenue to be comparable to the current $6M to $7M range. There is another issue to be considered and that is , Capital Repairs. There is a Capital Replacement and Renewal Account from which to pay these items. How hefty is it? None of the documents are clear. But it is known that apparently the roof is leaking and may require as much as $2M to fix. Revenues have been low for a variety of reasons. In 2003, the team was sited in a new geographical location and it took time for fans to adjust their mindset to make the drive to Glendale. Moyes and the NHL have not had a particularly strong track record in booking other events into the arena. In fact, this year saw the least number of non-hockey events booked than in any previous year. Of course, the first lockout and the most recent lockout did not help. Add to this the fact that the team has not had an owner since 2009 and we have had a referendum attempt to get rid of the team and an election to void the sales tax increase. Throw into all of this mix, a national economy that took a nose dive. This team and this location have never had a fighting chance to realize its full potential. Joyce, if these documents have been released, would you be able to upload the file or host it on your site for review. Very interesting! I am confused with one statement. If the costs of operating the arena with the team will be in the $12M to $13M range, and the city rejects all bidders (forcing relocation of the team), why would it still cost $12M to operate the arena without those 41 home games? I thought Skeete reviewed these same books and estimated it costs about $6M for operations without the Coyotes? In any case, a proper RFP will produce numbers the CM’s (and hopefully citizens!) can fairly compare in order to land the most qualified, lowest-priced arena manager. Perhaps it won’t cost $12M to have someone manage it after all. John, I have your email address.when I have time I will scan them in and I will email them to you. The only reason I have these docs is because I requested them under a Freedom of Information Request. This information was NEVER received by council or upper management. Someone in the bowels of city hall received the information and filed it away never to see the light of day until I made my request. This is EXACTLY the kind of information people like me crave! Thank you and keep it up!